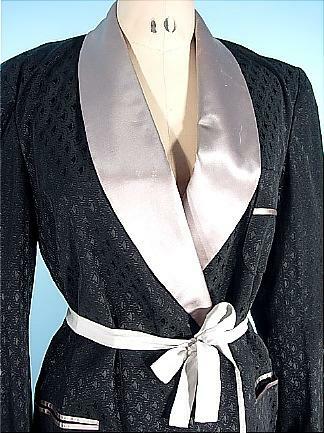 #9786 - Dated November 29, 1950 A. SULKA & Company Black Ribbed Jacquard Silk Smoking Jacket and Pants / Lounging Pajamas Trimmed in Blush Lavender Satin! If you don't know Sulka, you should! It's the top of the line for men's silks! 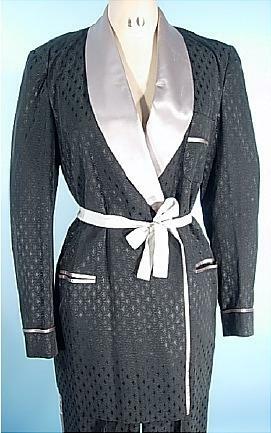 Even Clark Gable's estate highlighted his Sulka robe. 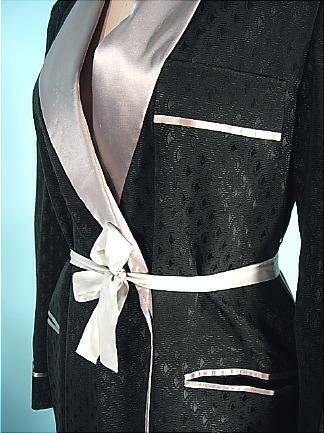 In 1998 a Sulka silk smoking jacket alone cost $1,750! 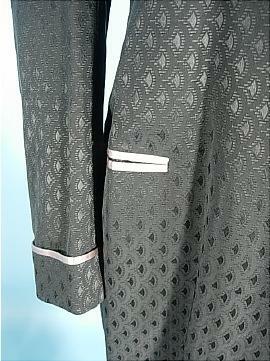 This PJ set has two original tags, one which has the date of 11/29/50 tailored specifically for customer number 44343. If only I had access to the company database! Damn! My favorite comment on Sulka is from Forbes Magazine in their "100 Things Worth Every Penny" list includes Sulka Silk Pajamas! 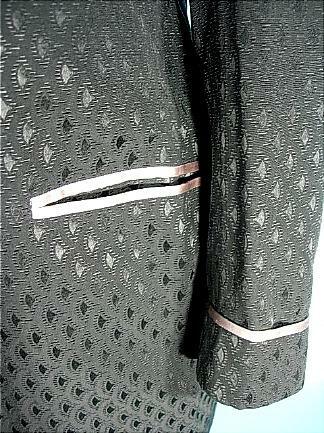 Black ribbed jacquard silk trimmed in a blush lavender satin. The original sash is missing, so I just tied a ribbon at the waist for show. 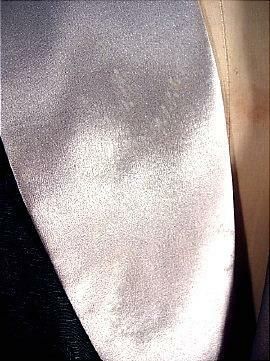 It's worth getting matching satin and making a new sash. Pants lined in awesome feeling white silk. Jacket lined in same also incredible feeling. Cuffed pants. lavendar silk satin!!! Measures: Pants: 30" waist (with extra tie to cinch a bit smaller) x 29" inseam. 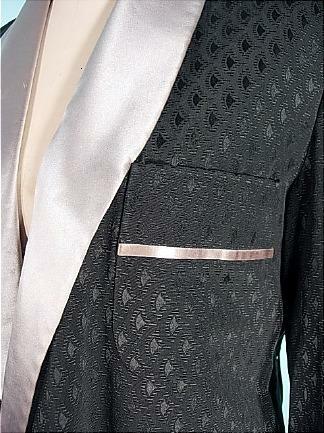 Jacket: 34-36" bust, 17" underarm to cuff, 16" across back between armseams. Originally likely a man's... it will fit a woman beautifully!!!! 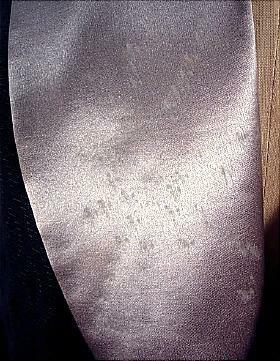 Excellent condition except for the fact that the satin lapels have phantom marks seen in certain lights (see photos) from improper storage likely against some beaded garment, bruising the satin in a starburst design. Actually kind of attractive! :) One small bruising of other lapel barely seen.